In the early days computers weren't part and parcel of our every day life, how that has changed - but now with our 25th anniversary approaching we are delighted to be stepping into the 21st century with our first eblast! 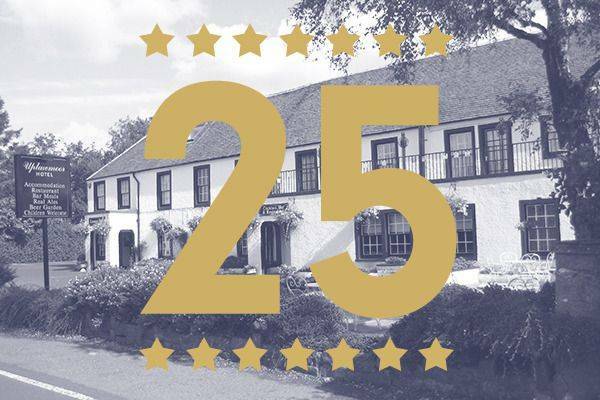 Obviously a lot has changed in the world since we took over the hotel in 1992 - but we are pleased to say that the great food and attentive service at the Uplawmoor Hotel has remained unchanged - hopefully always getting that wee bit better! Our Trip Advisor reviews are tremendous and we have achieved a Certificate of Excellence for 5 years running. Just recently we have been shortlisted and are now finalists in The Scottish Bar & Pub Awards 2017 incorporating The Sunday Mail Pub of the Year so fingers crossed! We hope to tempt you back to stay with an anniversary offer - celebrating ours or yours! Arrive to a bottle of chilled Prosecco and Belgium chocolates in your comfortable bedroom, indulge in a 3 course Dinner, stay overnight and enjoy a delicious Full Scottish breakfast in the morning cooked to order just the way you like it. Stay an extra night bed and breakfast for just £40 per couple. To book please go the traditional way and call 01505 850 565 or email info@uplawmoor.co.uk and quote "anniversary offer" available until the end of November 2017.